Bob Stephens and Gary Bensley shake hands as the acting general manager powers are transferred, while Mayor Steve Russell watches. Hornsby Shire Council has appointed a new acting general manager, as the maximum 12-month term of Gary Bensley has ended. Legislation states that no individual can act as a council’s general manager for more than 12 months. The new acting general manager is Infrastructure and Recreation Manager Bob Stephens, who is also deputy general manager. “It would be pointless of Council to appoint a permanent general manager until we find out if we are going to be amalgamated,” Hornsby Shire Mayor Steve Russell said. Mr Stephens has spent more than 25 years working in local and state government, including 13 years at Hornsby Shire Council. 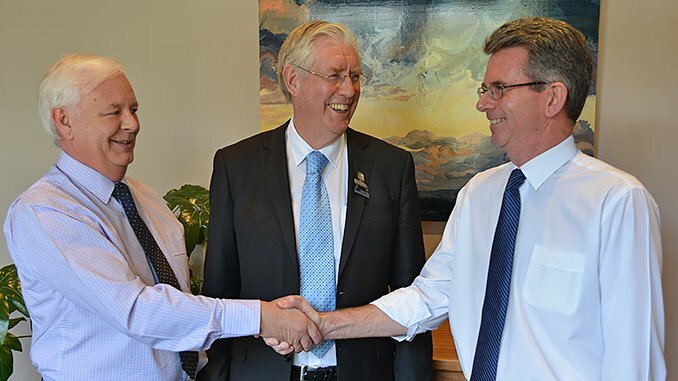 “Bob has done an excellent job and has a good grasp of the issues facing the Shire, with a strong focus on customer service” Mayor Russell said. Mayor Russell also thanked Mr Bensley for his contribution. “Gary has done a great job steering Council through these uncertain times for local government and he deserves praise from the entire community,” Mayor Russell said. Mr Bensley has returned to his position as Council’s corporate support manager and will continue as deputy general manager. “It has been a privilege to act as Council’s general manager and I am grateful for the opportunity,” Mr Bensley said.